This water adjustment lesson is for children who are taking swim lessons for the first time. Rarely does a child come to me, walk in the tot pool, and put his or her face in the water. I have developed a fun “bag of tricks” to help your child become comfortable in the water. Your child must put his or her face in the water in order to swim (Please see “When Is My Child Ready For Swim Lessons” and “If I Only Had A Nickel For Every Time I Heard…..”). As moms, dads and grandparents, you have probably spent countless hours bathing your child with his head out of the water and using a cute turtle washcloth to prevent water from dribbling down his face. Now you have signed your child up for swim lessons in a giant tot pool, and I am pouring water onto his head with a watering can. Can you picture this? Yes, that is your child crying. So-how do I help children adjust to the water? I begin by using little watering cans. We fill the watering can with water and start to “water” our legs, arms, hair and faces. We sings songs. If this goes well then I fill the dolphin and shark squirt bottles and we spend a “little” time squirting water on ME. This depends on the class. If there is a lot of crying, I do not use the squirt bottles. Crying is contagious. 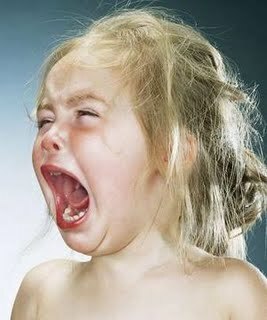 Even if your child is crying, please act happy, try to make it fun and remember to smile. I also use miniature bottles of bubbles. Children love to blow bubbles. And if the bubbles spill, the pool manager will not get upset. Just sayin’. Also, the miniature bottles are easy to refill. After a little bit, I like to take the bottles away from the children and just let them hold the tiny wands. The children can make water bubbles by holding the wand very close to the water and blowing. I hope you can see where I am going with this. Yes, a Tootsie Roll for you! The children’s faces are getting closer and closer to the pool water. 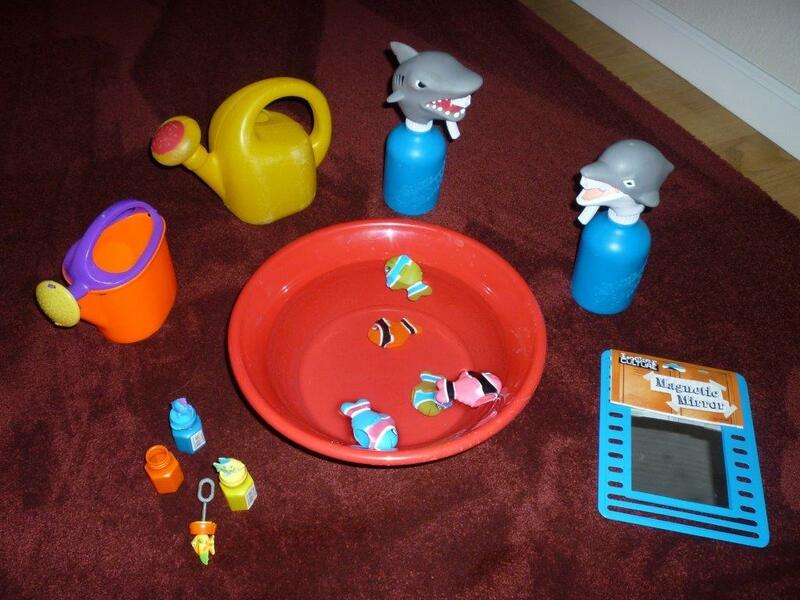 Swim Toys: Watering can, squirt bottles, bubbles, plastic bowl, fish puppets and mirror. Next, I sit the children in the shallow end of the tot pool, and I pass out big colorful plastic salad bowls and fish “finger puppets” (fits on two fingers). Some of the children will be ready to lie on their tummies. 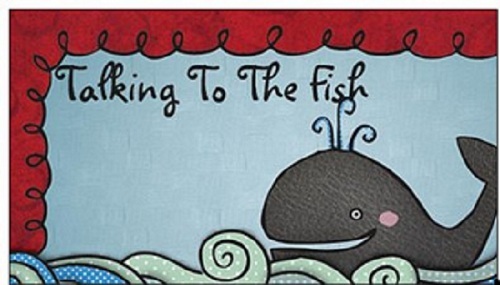 I show the children how to put the fish puppets on their fingers and we “talk to the fish.” Yes, the name of my blog! We begin by blowing bubbles into the salad bowl filled with water and “talk to Nemo.” Why do I do this? Children do not want to put their heads into the big and scary swimming pool. However, children feel safer putting their faces in the bowls. I teach the children how to blow bubbles out of their noses. Next, I give them the Unbreakable Locker Mirror. Children love to look at themselves (adults too). It’s true. We sit on the floor in the shallow end of the tot pool and look into the mirror and blow bubbles. Again, if the “advanced” children are ready, I have them lie on their tummies and blow bubbles with their arms and legs extended straight out in the Superman Position. When the children understand this concept, I have them put the mirror UNDER the water, so their mouths and noses are much closer to the water and we blow bubbles. This sounds like this all happens in one day. Surprise! This takes many hours and about three to four weeks. Sometimes longer. It’s like potty training. Children will do the above skills when they are ready and not any sooner. I wish that I had a nickel for every time a parent asks me when his child is going to put his face in the water. When the student is ready, the teacher will arrive. True Story, My grandchild started at the Pool in 2010, I had given her Summer Swimming Lessons, (NOT WITH BARBIE).. One of the young girls (?swimming instructors). has 5 kids in her class. on the third lesson, the instructor had the kids on the wall in the big pool (ages 5yrs old), she would take a child out to the middle leaving the children unprotected. One of the kids went under the water grabbing onto my grandchild pulling her under drowning my grandchild. Now? why did this happen, the instructor was not trained nor did she have the skills to teach. This was just the first mishap. In 2011, Winter, I put my grandchild again in swimming lessons thought we would try it again this time we got (Barbie) for the first time. YEA! It was amazing, This wonderful women took the fear out of my grandchild with in the first week, by the end of the month this young (6year old) was swimming and enjoying the water. Thanks Mrs. Barbie for Teaching my Grandchild not only how to swim but to love the water.